The old country song by Eddie Rabbitt, Drivin' My Life Away, was the reminder that for some, you just "Gotta keep rollin'" Maybe you're headed for that "destination" RV park, or maybe you're just trying to beat the sunset, but having something good and hot to eat at the other end is a goal most of us look forward to. Can you cook and "keep rollin'"? Absolutely! Cooking with the crock pot in the back seat (for motorhomers) or in the trailer can be a reality with a few cookin' caveats. First, the issue of power: If your rig is equipped with a shore power generator or a power inverter of suitable muscle, you can cook up in your standard shore power crock pot with ease. If you don't have either the of the above items, your alternative is a 12-volt crock pot. Yes, they do make 'em, and if you can't find one at the trucker's store at your friendly road-side truck stop, you'll find such animals available on the Internet--try shopping Amazon using the search words, "12 volt crock pot" or "12 volt slow cooker"
If you do opt for 12-volts, keep in mind a couple of points: Your average 12-volt outlet that bundles with a TV antenna amplifier isn't a good candidate for plugging into. These fellows are usually pretty limited in current capacity, say around 8 amps (which translates to less than 100 watts). Plug in a lotta watts crock pot and prepare to blow fuses or melt something down. Better you should wire your own outlet to the house battery with the appropriate gauge wiring and a fuse or circuit breaker to back it up. Where to cook: In light of the motion kicked up while rolling down the highway, it's best to keep your crock-cooker properly corralled. The galley sink is an excellent choice for containing a crock pot--if anything does slop out of the pot, the sink catches the mess. Keeping a lid on it is the next question. Both for safety reasons, and to keep the heat in the crock pot, you don't want the lid to come off the cooker. Some RVers who crock pot cook say they actually bungy cord the lids onto their pots. 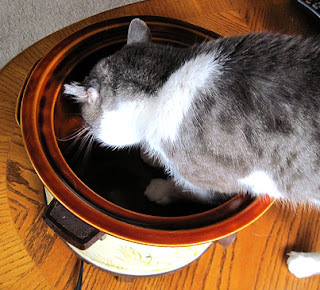 Others swear by crock pots with specially designed lids that fit tightly into place. You may need to stretch your bungy cord--or your imagination--to overcome the issues of a loose lid. Clean up? Who wants to do dishes in the RV? Check out Reynolds Slow Cooker Liners. A heat-resistant plastic bag, fits right down into your crock pot. Put all the ingredients right in the bag, cook 'em, eat 'em, toss out the liner and no washing required. Available at many Walmarts for about $2 for a box of four liners.